Discussions Magazine Music Blog: GUMBY: An EXCLUSIVE interview with JOE CLOKEY! GUMBY: An EXCLUSIVE interview with JOE CLOKEY! Time flies when you’re made out of clay. It’s not every day that a citizen of Gumbasia becomes a pop culture icon in the United States, but that is exactly what happened to Gumby. This oddly shaped green fellow has truly become a phenomenon since first created by Art and Ruth Clokey back in 1955. Now celebrating his 60th Anniversary, Gumby has become one of the most identifiable animated characters of all time – most certainly right up there with the likes of Mickey Mouse, Elmo and Bugs Bunny. But there was much more to Gumby than most people give him credit for. As an adult, we view Gumby’s world as surreal and trippy – not unlike an acid trip. However, Gumby actually views the world through a child’s eyes. And like a child, he uses his imagination, boundless energy, innocence and optimism to navigate a strange world he doesn’t yet fully comprehend. And that’s OK, because Gumby was figuring things out as he went along, just like everyone else. It didn’t hurt that Gumby taught children about things such as science and history by being able to ‘walk into any book,’ but his contribution to our childhoods doesn’t end there. Gumby also showed children the importance of friendship – thanks to his pony pal Pokey – and overcoming obstacles in life, which were usually represented by The Blockheads. These are all things that stick with children in their subconscious. One man’s imagination may have shaped Gumby, but Gumby helped shape the imaginations of millions of children since he was first conceived six decades ago. The release of Gumby: The Complete ‘50s Series (The Gumby Show) on DVD is a gift to all Gumby lovers. 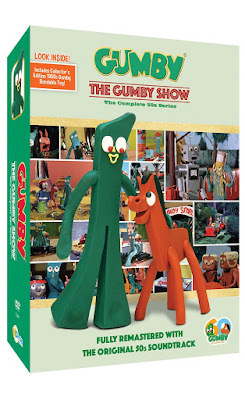 This set features all the original episodes of The Gumby Show as they originally aired on NBC in the second half of the ‘50s. They have been digitally remastered from the original film rolls and are presented in full-length glory complete with original voices, sound effects and music. There have been Gumby releases on video in the past, but nothing quite as magnificent as this set. It is still as timeless and charming today as it was when it first aired. 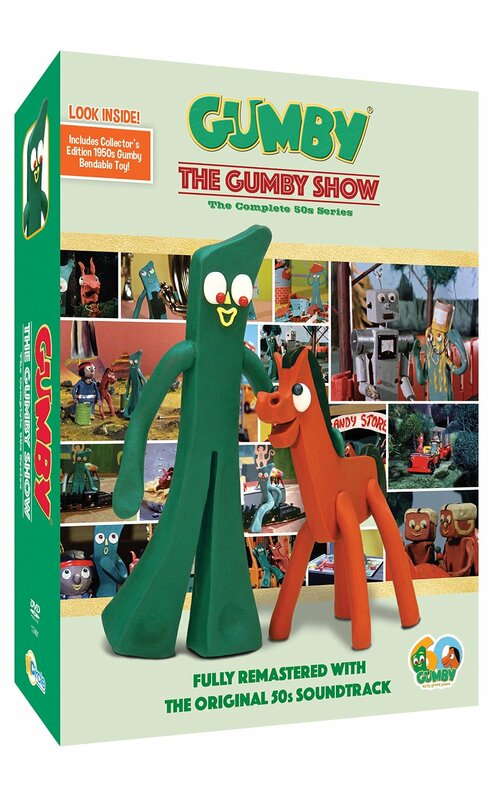 The sets and characters look absolutely stunning and fresh, sure to bring back memories for longtime Gumby fans while creating new ones for a whole new generation. You’ll believe that a man can reach the moon on a fire truck ladder! STEPHEN SPAZ SCHNEE: How are you feeling about this release? 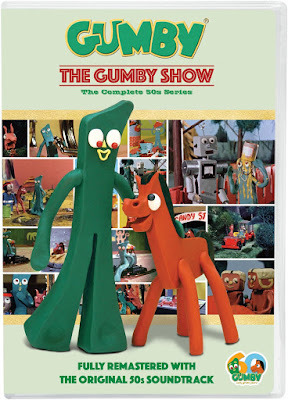 JOE CLOKEY: This is the most exciting release of Gumby episodes ever. I have been waiting for years to do it right – and we’re doing it right. I spent the last seven years going back to the original cameral rolls that they were originally shot on – 16mm Kodachrome film. They’ve only been used once to make an inter-negative back in the ‘50s and then they were stored. I went back to the vaults and found these. We went from the original camera rolls to digital. And they look great. The original episodes had been cut in half and made into two episodes back in 1960, and they’ve been seen that way ever since. They weren’t as crisp and colorful because they had gone through an inter-negative and then a negative and then copies – you’d lose resolution because of the technology of copying it. I went back and took the film rolls and edited them the way my dad originally had intended them to be, so instead of two five minute episodes, they are now one whole 10 minute episode. It really works. I put the original soundtrack on with the original voices, the original music and effects. The original Kodachrome film is better than anything you’d get today anyway – its amazing visual quality. The colors just pop. I see things in the sets of these episodes that I’ve never seen before. It’s going to blow people away – it looks like we shot them this year. I couldn’t be happier about it and I can’t wait for everybody out there to get it and enjoy it. SPAZ: Do you know why the original full episodes were split into two halves? JOE: Yes, because of the format system in the early ‘60s, they wanted to fit three or four episodes per half hour segment, versus two. It was for formatting for TV commercials of the day, so dad did it. What is funny is that the episodes still worked – he was able to edit them in a way that they still worked separately. Sometimes they were a little disjointed and people would just say, “Oh, that’s just part of the surrealistic nature of Gumby!” (Laughs) While it’s true that Gumby has a surrealistic, trippy, artistic side, the edited episodes didn’t make as much sense sometimes. Now, when I put them back together, there really is a beginning, middle and end – there really is a conclusion to the story being told. They make more sense. They still retain the amazing charm that my dad intended. The good natured part of what Gumby is all about – he always leaves a place better than when he found it, he has a loyal best friend, Pokey, and they have adventures together – it has those elements, but Gumby is also about the art, the stop motion, the clay, the morphing. You go into a book, you end up in space. You go into another book, you end up in the old west. You name the adventure that you can imagine and Gumby can do it. It is a physical magic trick – clay stop-motion is a magic trick. It’s taking real life characters and objects and having them move magically, because of the frame by frame animation that the animator does. You can do amazing stop motion and still have a boring TV show. What’s amazing about Gumby is that there are great stories – they are timeless, iconic stories that work as well with today’s kids as they did with every other generation that grew up with Gumby. SPAZ: Do you know what inspired your dad to create Gumby? JOE: My dad was studying night school at USC Film Department. He was studying under Slavko Vorkapich, who was an esteemed movie maker back in the day, and he was the head of the USC film department. He was teaching my dad a really cool film methodology called ‘kinesthetic film forces.’ What my dad was learning about them was moving the camera and editing and moving the object you’re filming in such a way that it excites the nerve endings in your body and “massages the eye cell” as my dad used to say. It would viscerally move you – you could feel it in your nervous system. To show this technique he was learning to his teacher, he made a three minute music video called Gumbasia animated to the beat of Jazz music. It was an amazing, mind-blowing thing. It moves you, the way it works with the music. It was the first clay-animated music video ever, but it was using kinesthetic film forces. It heightens the senses when you watch it and my dad was doing it in 1953, which was pretty amazing! In 1955, he was able to show it to Sam Engle, the president of 20th Century Fox in the big Darryl Zanuck projection room. Engle, who was directing Sophia Loren at the time, paced back and forth and said, “Rewind that film, I want to see it again.” And then he looked at my dad and said, “Art, that’s the most amazing film I’ve ever seen in my life. I want to go into business with you!” And my dad thought to himself, “Oh my God, he’s directing Sophia Loren, I’d love to do that!” (Laughs) In the next sentence, Sam said, “You know, Art. I’m really concerned about the quality of children’s television. Can you make clay characters out of those shapes and forms and tell stories?” And my dad said, “Sure, I’d love to do that!” My dad came home to my mom, and mom came up with the shape of Gumby and the two of them got going. They formed a company called Clokey Films and they produced a pilot – an unaired version of it is actually in this box set and has never been released remastered – and it was shown to Tom Sarnoff, who was the head of production for NBC. Tom, this young head of production, saw the Gumby pilot and loved it and said, “Art, I’m going to give Gumby his own show on NBC.” My dad had complete creative freedom to do as he wished with these stories. The crew he assembled made amazing episodes. These ‘50s episodes are the magic that makes Gumby fly, that makes Gumby work in every generation. There’s something really special about them. SPAZ: Who supplied the voices during these early episodes? JOE: In the very early episodes, my mom and dad and Al (art director) and Ruth Eggleston were almost all the voices in the first 11 episodes. Ruth Eggleston was the voice of Gumby. My dad was the voice of Pokey and Gumbo (Gumby’s dad), and a lot of the other characters. In the second 11 episodes of the ‘50s, Dal McKennon was the voice of Gumby. Dal also did voices for Disney. He did voices on Bedknobs & Broomsticks, Mary Poppins and voices for Disneyland – you can hear him on Pirates Of The Caribbean and Thunder Mountain. In those second 11 episodes, my dad still was the voice of Pokey and they both did a lot of other voices. SPAZ: Gumby is of no given race, age or sexuality. It is generally assumed that Gumby is male, but it’s really up to the viewer who defines who Gumby is and what Gumby means to them. Would you agree? JOE: Yeah. My dad always referred to him as the world’s first and most famous clay boy, so he always assumed he was a boy. But if you look at him, he’s naked and you don’t see…. (Laughs) He can morph into anything he wants. He’s like a shaman shape shifter. SPAZ: Everyone has a best friend like Pokey, and we all encounter blockheads on our journey through life. Did your dad hope that Gumby’s perseverance and positive attitude, as well as his endless imagination would encourage children to approach their own lives in the same way? JOE: What you just said is exactly what my dad and mom wanted. My dad always said it was a gift of love to the children of the world. A spark of imagination, creativity, the kinesthetic action, the heart and the art – that’s the brew that makes up Gumby. And that’s why it works. If you think of Pixar movies like Toy Story – that’s the formula my dad created. That’s why movies by Pixar work – characters that have good character. SPAZ: Do you have a particular favorite episode from this release? JOE: I’ve always loved Rain Spirits. My dad was a quarter Crow Indian and there’s a reverence for Native Americans in that one that I really love. SPAZ: What did your dad think of Eddie Murphy’s portrayal of Gumby? JOE: My dad thought it was hilarious. He got a huge kick out of it. I’ve got all the VHS tapes that he recorded that feature all the skits that Eddie did. He was so excited about it. The way it came about was my dad and stepmom were doing a revival tour because Gumby had become popular again in the ‘80s. College kids in the ‘80s were really into Gumby. People were really digging it. Dad went on a 10 city tour at colleges across the nation and had people lined around the block to see Gumby on the big screen with my dad talking about Gumby. It was a huge phenomenon. A writer from SNL went to one of them and said, “Oh my God, this is happening! This is really something exciting!” So he wrote a series of skits for Eddie and Eddie made it happen. So, I always wanted to thank Eddie for getting me through college! Exclusive 'classic Gumby' bendable figure! GUMBY is the best! How long do we have to wait for GUMBY the MOVIE?